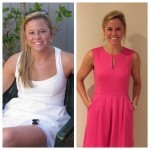 Brienne lost 28 pounds and 9% body fat! It was incredibly easy to follow and adhere to. Working full time and being in law school left me very little free time. This protocol actually made it easy for me to plan my meals, to the point where I almost didn’t have to think about it. The results are sustainable and become evident early on in the process which helps to keep you motivated. I am extremely excited for the future. I have learned so much about nutrition and am confident that I will be able to maintain my results. I feel such a greater sense of self-esteem and confidence now that I have all this weight off of me. I am very happy with the way my body looks – I feel healthy, lean, and extremely motivated to stay this way! I would highly recommend this program to anyone who is interested in losing weight in a healthy way. The products taste wonderful and never let you go hungry or feel unsatisfied. 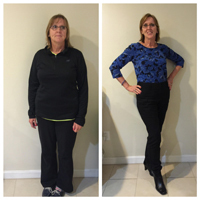 Diane got off 34 pounds of body fat plus got off BP medication! I would recommend this diet to anyone, and I do! Ideal Protein delivers, simple as that. If you follow the diet and your coach’s directions you simply cannot fail. Just sit back and watch the pounds dropping off. I would like to thank my coach, Tiana. 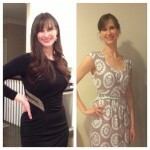 she’s been amazing throughout the process, supportive, and understanding of a corporate lifestyle-knowing how to adjust the diet form business trips, recommend ways of staying on the diet when/when food options might be limited due to a special setting. Overall she’s done a phenomenal job of guiding me through the diet phases and making sure I hit the most aggressive wight target that we set for myself at the initial meeting. I reached a low point back in June 2010. I was at my peak weight of 182 lbs and considering that I am only 5’4″, I had zero energy or self-confidence. I decided what the heck, i’ll try it-I’ve tried everything else. 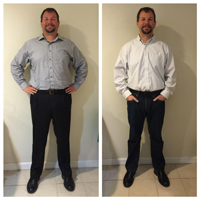 Even though I was approaching some of the most fun and social weekends…including the 4th of July, my birthday and a weeklong cruise, I stuck with the protocol the first seventeen days straight before my cruise and lost 18 pounds! Day by day of following this program, I felt better and better. I had more energy and I was feeling more self confident. I have lost 47 pounds and I feel FANTASTIC! I have dropped from a size 14 to a size 4/6. My life has forever been changed. If you are ready to change your life…this plan works! Besides, what do you have to lose…besides weight? I feel ten-million times better! I think this was a great program. It is demanding, but all the staff is very committed at helping you on your own personal journey” “Love Tiana :) very knowledgeable (and) works with your goals and what you want to achieve. I began the Ideal Protein program in November and hit my goal weight in about 3 months (yes, 25 pounds during holiday season!). I found the program to be really manageable so I actually went even farther and lost more. I felt great and Tiana really helped me to stay focused and explained to me how and why the IP program works. It has been life changing and now eating healthy has become a way of life. Are you ready to change your life? Contact Charles Street Family Chiropractic today at 617-720-1992 to schedule a consultation with Tiana.